Speaking at a town hall to which my congressman was invited, but chose not to attend. Three times on Friday and Saturday, I told the story of the death of my son. It never gets easier. It’s emotionally exhausting, yet I work to find places to speak and people willing to listen because his is the face of the injustice inherent in our so-called health care system. I stood alone outside the federal office building in Asheville Friday at noon as people at the stoplight honked their approval (this was the first time I’ve done this that no one flipped me off or said rude things). Then I packed up and went to a “listening” session sponsored by the NC Department of Health and Human Services, which is trying to put the best face possible on the legislature’s planned dismantling of Medicaid here in North Carolina. The right-wing agenda of the legislature has been the shredding of our social safety net ever since they took power in 2010. They have refused to even consider expanding Medicaid and have chosen instead to privatize it, to farm it out to their corporate friends, who will line their pockets with some of the limited funds meant to help people in need. I listened to a woman who is blind talk about losing her job, and with it, her access to health care, because North Carolina refuses to allow access to health care to people who live below the federal poverty level. I listened to another woman talk about trying to recover from a horrible accident while having no access to care because, even though she has obvious disabilities related to the accident, she has been denied both Medicaid and disability. I heard her vow, tearfully, to continue her fight. Like these two women, my son was not lazy, nor was he to blame in any way for his condition. He didn’t choose to have a birth defect that left him vulnerable to colon cancer. He didn’t choose not to buy insurance — that was decided for him by greedy corporate hacks who saw no profit in him. In fact, no one saw a profit in him until he had stage 3 colon cancer and needed chemotherapy. That’s when he became eligible for Medicaid (but only after he left his wife), and the drug companies collected more than a half million dollars while my son waited for approval for disability. He would not live to see a penny of it — his approval took 37 months and he was dead nine days when his first check arrived. This state destroyed a decent mental health system a dozen years ago when it privatized services. I know because I was the one reporter in the state who covered it from the beginning. I watched as people who needed help were denied services. I watched as the state made change after change after change to the system, never allowing it to stabilize. I watched as people died. When I returned to work after the death of my son, I found an e-mail telling me about the deaths of three young men who died within weeks after being released from state psychiatric hospitals without follow-up plans. One of them was released and dropped off at a homeless shelter that had been closed for months. He landed in a fleabag motel, where, in utter despair, he took his own life. No policymakers cared until the day the story ran. Then they announced a policy change: No one would be released from a state psychiatric hospital without a follow-up appointment with a psychiatrist and enough medication to carry them over to that appointment. It took more than the three deaths — it took public outrage over those three deaths — to change policy. Stories are powerful. Stories matter. That’s why I continue to tell my son’s story. 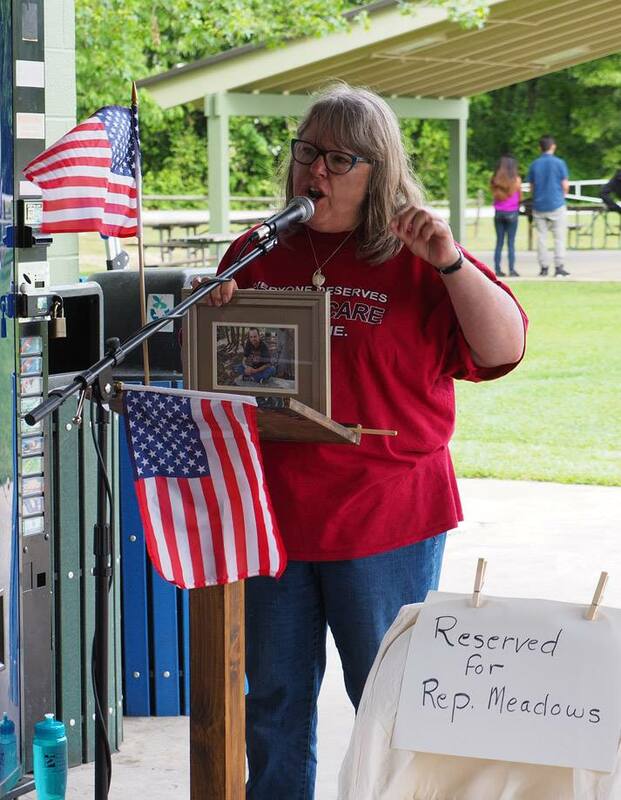 I told his story again on Saturday, at a Town Hall to which Mark Meadows, our member of Congress, was invited, but to which he didn’t come. I talked about Mike’s experience not getting what he needed, even from the emergency room. I explained that the ER only has to stabilize patients, not look for or address the root cause. Two women came up to me after I spoke and told me I was wrong. I explained again how the ER only has to stabilize patients and they insisted what my son got was treatment. “I’ve studied this,” one of them said to me. She tried again to tell me I was wrong, and I just turned and walked away. Some people refuse to hear the truth and I can’t waste my time trying to get through to them. I decided to not think she’s crazy. I need to feel his presence whenever I can. I need for him to not be completely gone from me. So, I tell his story. In his memory, I work for access to health care for every human being, and I won’t stop until we’re done.